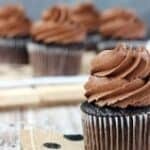 This is the BEST Chocolate frosting recipe! It’s a homemade chocolate buttercream frosting made with cocoa powder. 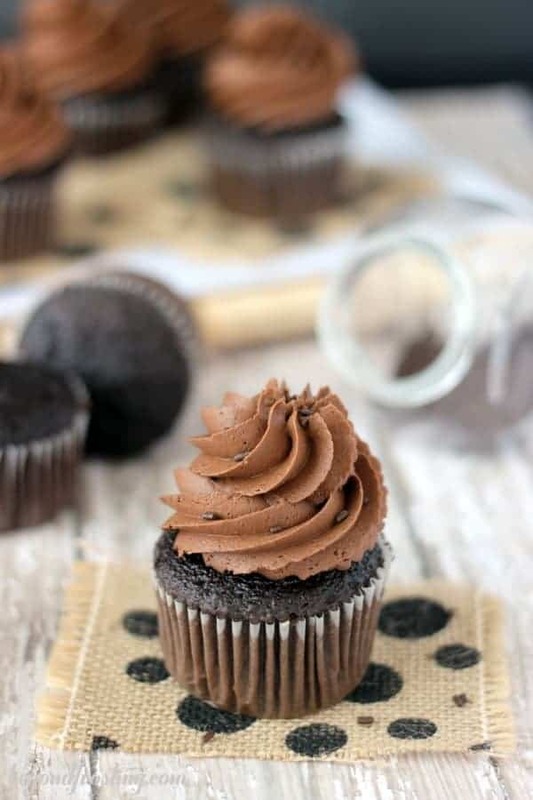 It’s the perfect chocolate frosting for piping cupcakes and for decorating cakes. Read more about my tips for starting with COLD butter! 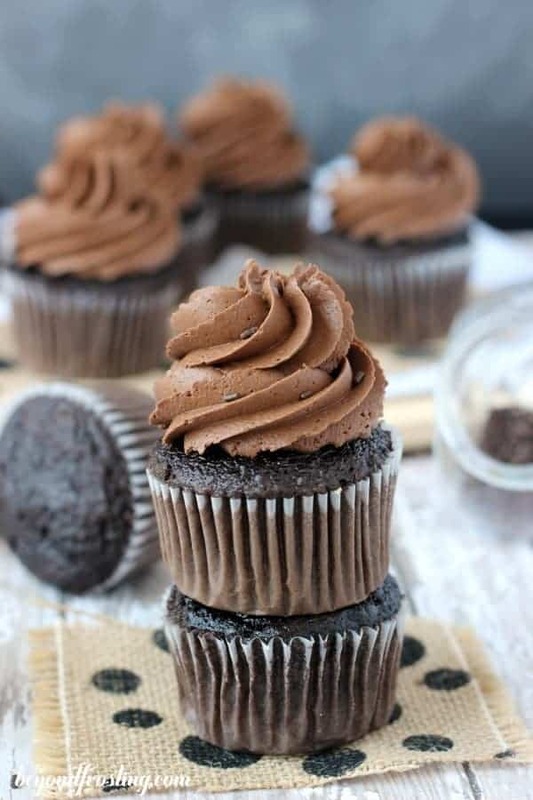 I am a firm believer that a chocolate frosting can never be too chocolaty. I think that’s why my boyfriend husband fell in love with me. HA! Kidding. Kind of. When we first met, we made a chocolate cake together. I helped him bake it and make the frosting. He wanted the classic Hershey cake with Hershey frosting. When we were making the frosting, he kept telling me to put more and more cocoa powder. I kept saying MORE? Really? His reply was always yes. 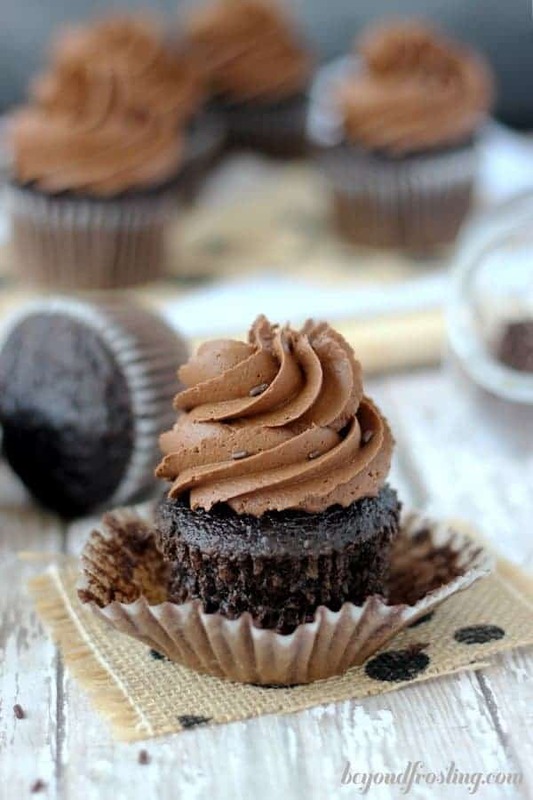 This is the BEST Chocolate frosting recipe! It’s a homemade chocolate buttercream frosting made with cocoa powder. 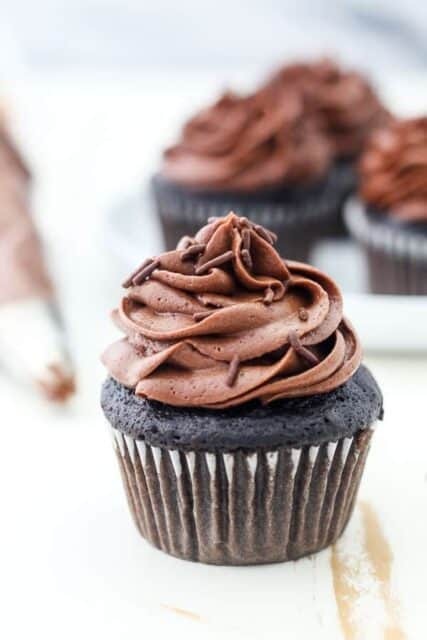 It’s the perfect chocolate frosting for piping cupcakes and for decorating cakes. Just like my vanilla frosting, this frosting also starts with cold butter. Cold butter allows you to control the consistency of the frosting and often produces a stiffer frosting that is great for piping! Don’t rush this step. Since your butter is cold, it naturally needs more time to be broken down as you incorporate more air into the butter. Scrape down your bowl several times during this process. How do you know you’re ready? The butter has grown in volume and turned lighter in color. It’s would be easily spreadable if you were to spread it on a piece of toast. When I make chocolate frostings, I always add the cocoa power right after the butter. I want it to be well incorporated into the frosting. I usually like sift my cocoa powder because most cocoa powder is somewhat clumpy right from the container. Next, we’re adding the powdered sugar. I usually do this 2-3 cups at a time. If you do it all at once, it will not only take a lot longer, it will also be more difficult to get it all incorporated properly. I also mix in my liquid ingredients with every couple cups of powdered sugar. Liquid ingredients might be extracts and then heavy whipping cream or milk. My preference is always heavy whipping cream. It naturally helps whip the frosting the more that you beat it. It also helps make it super creamy. If you don’t have heavy whipping cream, milk is the next best substitute. This frosting is perfect for chocolate cakes or cupcakes. If you’re looking for something a little different, you might love my Chocolate Fudge Frosting which is made with melted chocolate. 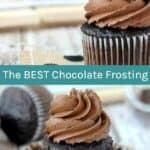 I also love my chocolate cream cheese frosting, it is the ultimate melt in your mouth chocolate frosting. If you’re looking for a quick, in-depth guide, be sure to read through my tips for how to make buttercream frosting. I will do a quick recap of the steps needed to make my Best Chocolate Frosting. Start with cold butter! Cut butter into pieces, about 1 tablespoon in side. Using the paddle attachment, whip butter for 5-7 minutes, scraping down the bowl occasionally. Next, Sift cocoa powder into mixing bowl. Make sure all that cocoa powder is well incorporated until you move onto the next steps. Finally, we’re alternating the powdered sugar with the liquid ingredients. Add 2 cups of powdered sugar and mix on low speed until incorporated into butter. Then add the vanilla extract and beat these for a couple minutes until it’s well combined. Repeat these steps using the remaining powdered sugar and heavy cream. One all the ingredients have been added, increase speed to medium-high and beat for another 3-5 minutes to whip additional air into the frosting. Can I make this frosting ahead of time? Yes! This frosting can be made in advanced and stored in an airtight container for up to 2 days. Any longer than that I would recommend refrigerating. Allow the frosting to come to room temperature for attempting to use it. 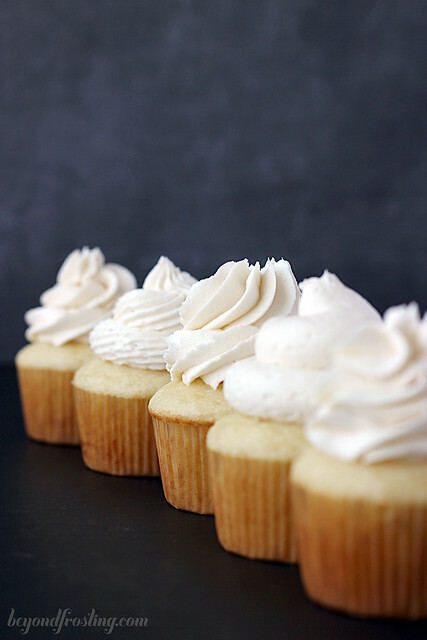 Even though you are making your frosting ahead of time, you may want to remix and rewhip your frosting before piping. The reason for this is that as the frosting sits, all that air you whipped into it when you made it slowly settles as it sits in your container. Do I need to refrigerate my frosted cupcakes? If you live in a hot and humid environment, you should probably refrigerate your frosting and allow it come to room temperature before serving. Otherwise I leave my frosted cupcakes in an airtight container for 2-3 days without a problem. What type of cocoa powder can I use? 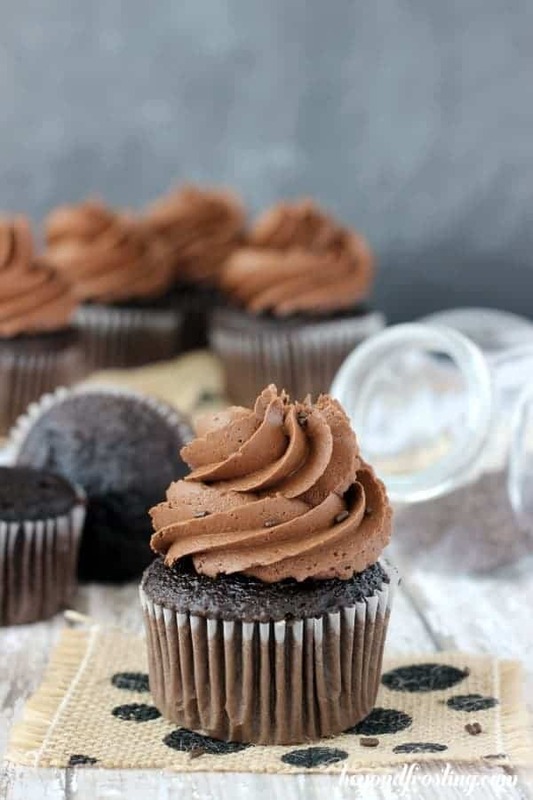 For my chocolate frosting recipes, I use both a sweetened and unsweetened cocoa powder as well as Dutch processed cocoa power. Hershey’s Special Dark cocoa powder is my go-to. 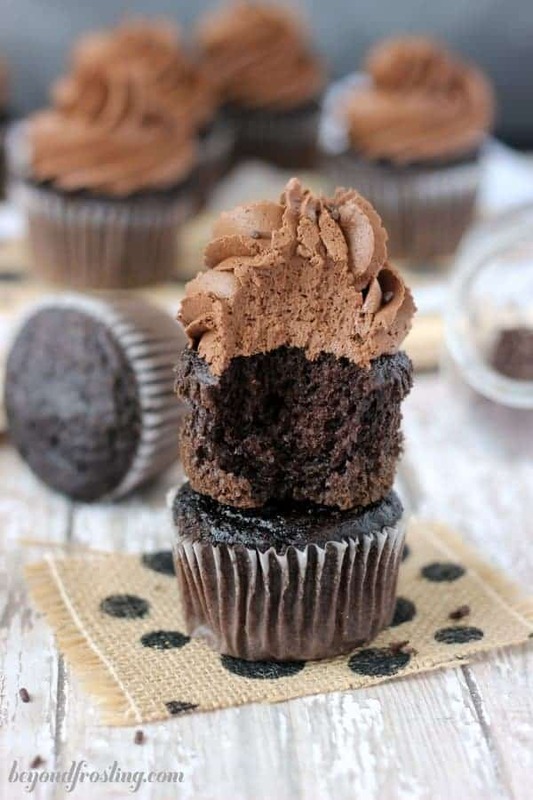 It’s a sweetened cocoa powder that helps get that darker, ultra-chocolate looking frosting. For unsweetened or Dutch processed cocoa powders, I use both Hershey’s and also Rodelle Baking Cocoa. Hershey’s is the most common one found in the grocery stores, but if you’re looking for a premium product, Rodelle is my favorite. The Rodelle baking cocoa has one of the highest levels of cocoa butter on the market. It’s also a subtler chocolate flavor. Can I make this frosting with a handheld mixer? The short answer is yes, anything is possible. However, it will be difficult for you to make large batches of frosting, simply because the powder of a handheld mixer is not the same as a stand mixer. You will likely need to spend even more time whipping the butter both in the beginning and throughout when adding the powdered sugar. 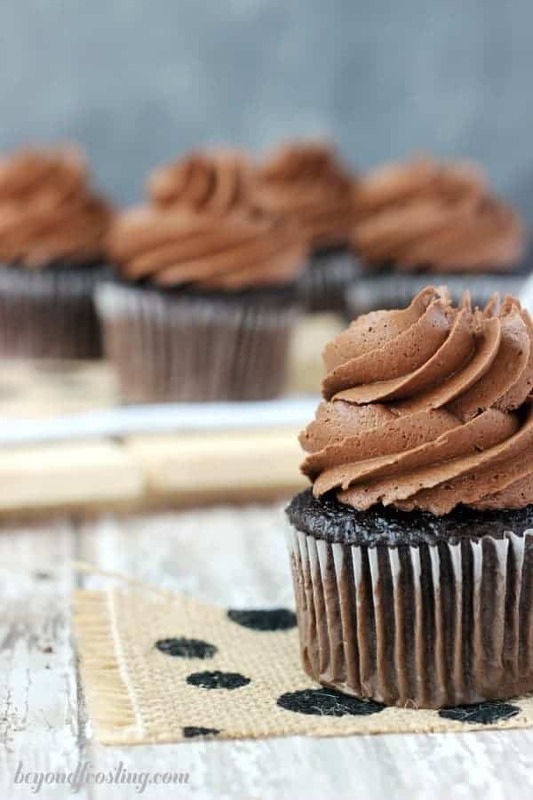 You will love my recipe for the Best Chocolate Frosting! There’s so many ways you can use it. Cut butter into pieces, 1 tablespoon size. Using the paddle attachment, whip butter for 5-7 minutes, scraping down the bowl occasionally. Beat until butter looks light in color and has more volume. Sift the cocoa powder into mixing bowl. Turn the mixer on slow speed and beat until cocoa power is mixed into butter. Add 2 cups powdered sugar and mix on low speed until incorporated into butter and add the vanilla. Continuing adding the additional powdered sugar, 2 cups at a time and alternating with the heavy whipping cream. and beat on low speed until sugar is incorporated. Increase speed to medium-high and beat for 2-3 minutes before adding more powdered sugar. After all the powdered sugar has been added, increase speed to medium-high and beat for another 3-5 minutes to whip additional air into the frosting. Delicious! Only issue I had was it was thick and not pipeable. Add more whipping cream? Whip longer? I did use canola oil instead of vegetable oil (it’s all I had) ?? Oops the oil was in the vale not the frosting! 🤭 thank you! My kids devoured your vanill cake with this frosting! No worries Megan! Thank you so much! I made this tonight and it tastes delicious, only thing is mine is very thick and hard to pipe. More whipping cream? Your recipes are absolutely fabulous. I have done a few of them, with so MANY compliments. Just wondering if you have any tips for me…I only have a hand mixer, along with osteo-arthritis. The cold butter thing takes me forever & hurts my hands. Any ideas? I can’t afford the Kitchen Aid mixer. Hi Robin, thank you for your comment. I would be sure to cut the butter into cubes, about 1 tablespoon in size and microwave for 10 seconds to soften it a little bit. The other thing I would try is doing only half the recipe at a time, but I don’t think that would cut down on your mixing time. The recipe is intended to be more stiff. If you’re not worries about that, you could start with a butter softened to room temperature and this would surely cut down on your mixing time. Wishing you the best and if you have more question, feel free to reach out! Made both the vanilla and chocolate frosting today, delicious!